Why Antennas Have Ground Plane? (1) Only Whip, no ground plane radials. (2) Whip with horizontal ground plane radials. (3) Whip with 45 degrees slanting ground plane radials. The attached performance graphs show the importance & affect of ground plane radials. All the 4 radials were inserted between the outer PVC jacket and the braid of the coax. The zip ties were used to secure the radials in position, as these have a tendency to move and change 90 degree angle with each other. 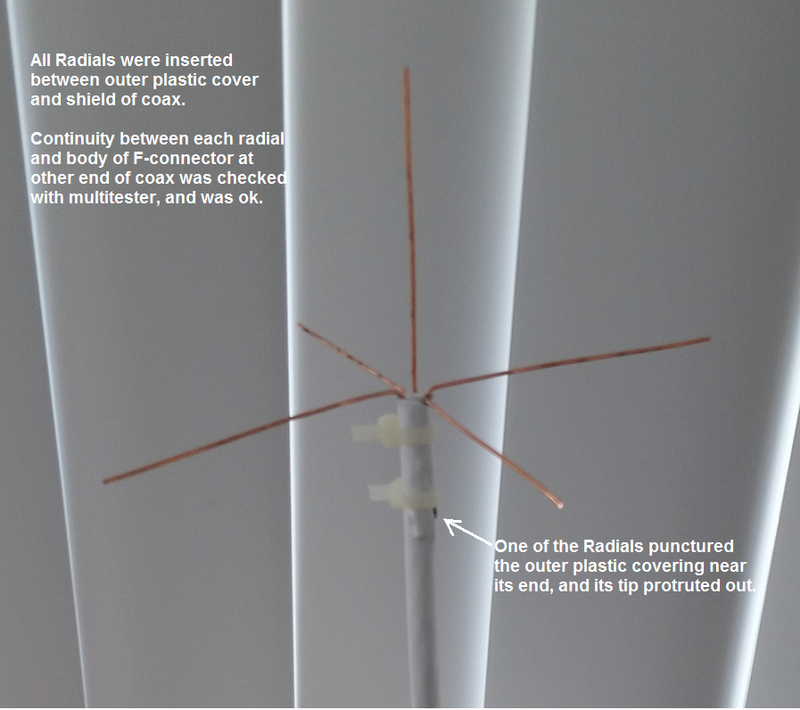 After completion, I checked the continuity between the body of F-connector at other end of coax, and each of 4 radials by a multitester. All 4 were found electrically continuous, as the multitester beeped on each radial. The radials were inserted in the same way as a center wires of a Coco are inserted between the PVC jacket and braid of adjacent elements. Here is a larger size photo of the monopole with radials inserted and zip-tied.